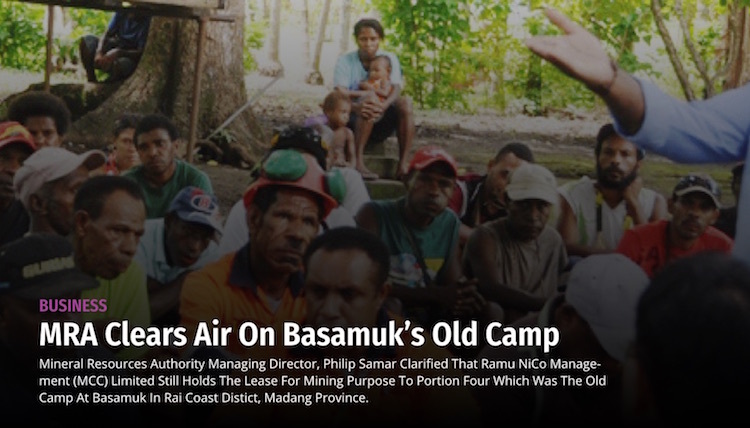 Mineral Resources Authority managing director, Philip Samar clarified that Ramu NiCo Management (MCC) Limited still holds the lease for mining purpose to portion four which was the old camp at Basamuk in Rai Coast distict, Madang Province. Mr Samar was responding to a petition by a group who claimed to be Lands Title Commission (LTC) declared landowners of Basamuk who petitioned the State and the developer over business opportunities, compensation, environment damages and other issues. The vice president of Ramu NiCo (MCC), Wang Baowen also attended the meeting. In one of their petitions, the group claimed that a portion of land which was previously used as the accommodation camp during the construction phase is currently being developed without their consent. This was after Ramu NiCo had moved its workers accommodation to a new location adjacent to Yaganon river. However, MCC community affairs general manager, Martin Paining clarified to the people that, that particular portion concerned is still within lease for mining purpose (LMP), and there was no specific agreement signed previously that after the construction, the land would return to the traditional landowners. One of the landowners argued that initially the then previous developer, Highlands Pacific Limited (HPL) had planned to build a school and a sporting field on that portion of land. However, locals have witnessed new accommodation quarters being built and also a fuel refueling station being erected within that portion of land. Mr Samar in supporting Mr Paining pointed out that Ramu NiCo had the license to operate and so long as they have the lease they can do anything on the land. He said under the LMP which had been transferred from HPL to MCC, the current developer the license is still valid and the developer can do any development of that portion of land. 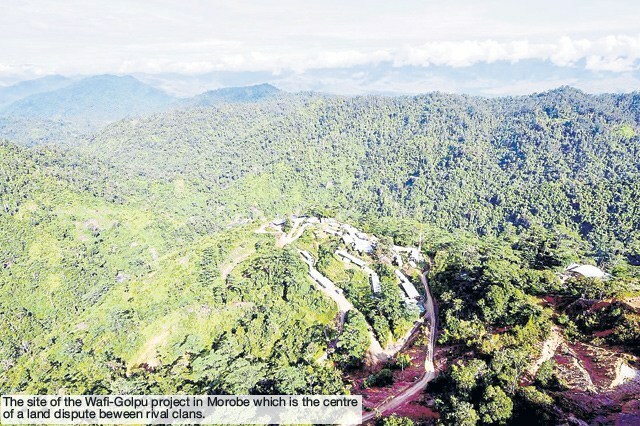 A local landowner group from the Hidden Valley Gold mine in Morobe province have called on the Minister for Lands and Physical Planning to intervene and stop a dubious land deal between a certain group and public servants over the existing mining lease area. The Nauti Landowners Grievance Committee of Nauti village in Hidden Valley made the call yesterday after several attempts made to the Department of National Lands and Physical Planning and the Registrar of Incorporated Land Group to cease the issuance of an ILG Certificate have fallen on deaf ears. 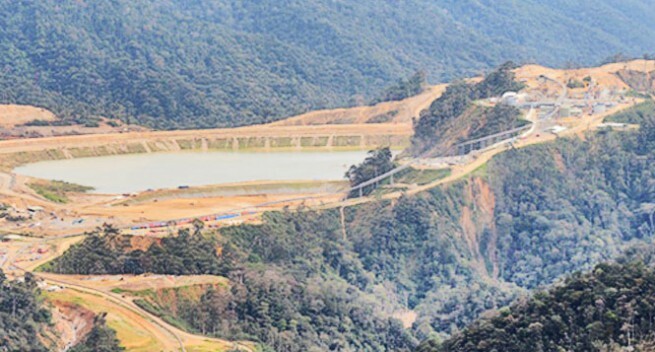 According to a National Gazette published on March 30, 2016 – a Nautiya Land Group Incorporated was recognised as an ILG of the same demarcated boundaries of Hidden Valley Gold mine. Committee chairman Ben Joseph said they lodged a formal complaint with supporting documentations with the Registrar of ILG and the Department of National Lands and Physical Planning to halt the awarding of the ILG in question since March 2017 but to no avail. “The department is not responding or corresponding with us (Nauti Landowners). Our attempts have fallen on deaf ears so we a now calling on the Minister for Lands and Physical Planning Justin Tkatchenko to use his ministerial power to intervene, put a stop and investigate those responsible for the issue of this dubious ILG certificate,” Mr Joseph said. He said the Nauti landowners Grievance Committee officially wrote to the Minister in September last year (Sept 28, 2017) for his ministerial intervention to launch an investigation and hold those responsible for exploiting and abusing the process of Customary Land Registration. The chairman said the matter was of grave concern because of the validity on how Nautiya Land Group was awarded ILG certificate despite some iconic landmark features like the Hidden Valley Gold mine and a 1987 Provincial Land Court Decision that has competently identified customary landowners of the mine. Mr Joseph said the land was owned by Yatavo Family of Nauti village which is from the Northwest part of the mine and the Biangais of Kwembu and Winima villages of Wau towards Southeast part of the mine. He said the Nauti, Kwembu and Winima were the current beneficiaries and parties to the Hidden Valley Gold mine under the Memorandum of Agreement (MoA) signed in August 5 2005 and the Royalty Distribution Agreement signed in September 15, 2009. All relevant documentation including correspondence to the Director of Customary Lands Registration, Registrar for Incorporated Land Group, Minister for National Lands and Physical Planning, dating back to March last year were sighted by this reporter. “There is evident that there was no proper consultation and verification of important detracting features made by the Nautiya Land Group leaders and the designated Government Officers which inevitably is a normal requirement in processing any ILG in the country,” Mr Joseph said. He added that the oversight of a high government impact project of national interest by government employees and the Nautiya Land Group is completely incomprehensible, unscrupulous and deceptive with intentions to a disrupt major government project. Mr Joseph appealed to the Minister for Lands to come down hard on those responsible and revoke the issuance of ILG certificate to Nautiya Land Group to avoid further inconveniences.